One final "treat" for some of you. If anyone in your immediate family (as in LIVES IN YOUR HOUSEHOLD) has a birthday in April, you can leave an extra comment on any of the contests. Enter to win the Complete Set of Mysterious Benedict Society books. Enter to win the Complete Set of Strictest School in the World books. *This contest was incorrectly marked at first. It is open to U.S. AND Canadian residents. Sorry about that! So - Canadians - you just have at it! Enter to win Mighty Acts of God Bible story book. Enter to win an autographed copy of The Sacred Cipher. Enter to win a title of your choosing from Sleeping Bear Press. Lastly, I was supposed to announce the winners from last week's giveaway. 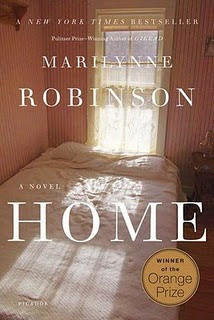 Congratulations are due KY Warrior Librarian and Ronnica who both won a copy of Home, by Marilynne Robinson. I'll be e-mailing you both shortly to collect your mailing addresses! If blogging can't be fun, then why do it? You have so many giveaways going on right now...and of books I really want. Excited to read Home, thanks! Happy April Fool's Day to you too! I just ran across your twitter page and this blog via the book whisperer!